This was a very bizarre choice for a movie whose entire selling point was "Hey! Look how many action heroes we can fit into one shot!" And while this failure didn't seem to hurt its box office sales, no one is going around proclaiming the plot of The Expendables is quality cinema. But while movies can compensate for a limp plot with actors and special effects, books are different. We are limited to the words on the page, which automatically means our plots and characters are held to a higher standard, as well they should be. There's a reason the book is always better than the movie, and that reason is the character driven narrative. Novels let us get into our characters' heads better than any other medium. We can show readers exactly what the people in our stories are thinking, their decision making, their fears and hopes. This unique transparency is the greatest strength of writing. It's what makes up for the fact that we don't have sound effects or visuals. If we ignore that, if we invite readers inside a character's head and then proceed to ignore them by making that character a passive passenger in the plot without agency or voice, then we've throw away the very thing that makes writing great. Plot in a character driven narrative is the story of clashing character motivations as defined by the setting. If your hero and your villain both want mutually exclusive things (such as to save/destroy the world), that's your conflict. Or if you have a character who wants something really badly and the entire world is against her, that's your conflict. Take your conflict and frame it inside the unique opportunities and limitations of your setting, and you've got your plot. This is the most basic difference between a plot and a character driven plot. Plot is just a series of related events that eventually lead up to a climax. "I got up, I went to the kitchen, I got a glass of water" is a plot. "I was thirsty, so I got up and went to the kitchen for a glass of water" is a character driven plot. They're both exactly the same, but one has motivation and therefore meaning. I--the character in this story--am doing something for a reason, not just going through motions. At this point you're probably thinking who would ever write that first kind of plot? Sadly, it happens far too often. Video games in particular do this all the time. Take Diablo III, for example. In this game, I play the Sorceress, but that doesn't really matter. The character of "the Sorceress" is completely defined by an avatar, a power set, and a handful of pithy lines. The writers try to give her motivation by having her proclaim that she wants to be the best, but it makes no difference in the end, because the plot marches on completely regardless of what the Sorceress wants or doesn't want. Her choice is to either move forward or die, which is no choice at all. When I play Diablo III, my character is framed as the heroine of the narrative, but in truth makes no actual important decisions. She is nothing more than a cog in the machine, an ultimately powerless passenger in the larger narrative. There is nothing I as the character can do, no choice I can make other than to go along with the plot. Even more telling, I can switch out my Sorceress for any of the other playable classes and the narrative remains the same. It goes without saying that if you can replace your main character with a completely different person and the plot doesn't change, your story is not character driven. Video games can get away with this because, sadly, the story isn't really the point of most games. We're playing to kill demons and get orange loot, not to make deep character driven decisions. Contrast this to narrative games like Mass Effect or the Dragon Age series where making character decisions is the gameplay and see how much better those stories are! That's because these stories are character driven. The plot turns not on unrelated, arbitrary events, but on what the characters want, what they're willing to do to get it, and how they fail or succeed to achieve those motivations along the way. 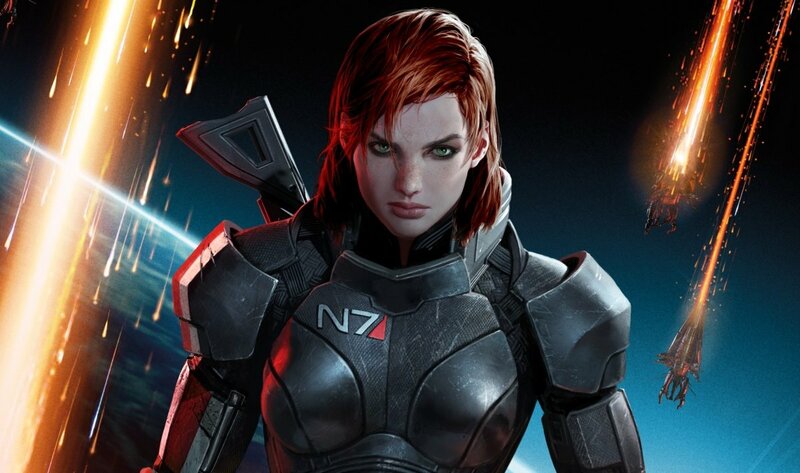 Give me FemShep any day! This isn't to say external things can't happen to move a plot forward. External forces like natural disasters or political upheavals are fantastic sources of pressure when you need to light a fire under your character's butts. But if your story is going to be truly character driven, then the main decisions of what to do and where to go must belong to the characters. They have to be the ones at the wheel, not on the rails. So whether you're just starting your plot, in the middle of a book, or working on your editing, it's always worth taking a moment to stop and think if your plot events are character driven, or if your characters are plot driven. It can be a subtle difference sometimes, but if there's any point in your book where your characters are making a decision based on where you want the story to go rather than what they want, that's a giant red flag. It's also probably a scene that you struggled to write, because forcing characters to go with the plot instead of the other way around never feels natural. Always pay attention to those feelings, because no matter how aware of your craft you become, storytelling is a gut feelings exercise at its core. If something isn't right with your story, you'll know. Don't ignore that feeling. Ignoring things that feel wrong because you don't want--or don't know how--to deal with them is the definition of lazy writing. So don't be that writer!! Trust your instincts, and trust your characters to take the wheel. They might do something crazy, but so long as you're willing to release control and give your characters the chance to take charge of their own stories, your plots will always be character driven, and that's never a bad thing. I hope you enjoyed this week's Writing Wednesday! To see all the other writing articles in this series, simply click the "Writing Wednesdays" tag at the bottom of this post. Thank you as always for reading, and I'll see you again soon. Yours always, and happy writing! I think I'm going to re-read 2k to 10k now (the book). How do you switch off the THING in your head that keeps telling you (I'm sure it does? Doesn't it?) that 'nobody will want to read this' and just do whatever you want anyway? I struggle! The picture of FemShep is the best thing in this post! Kidding, your advice is the best but still, I love that you referenced videogames for it. Thanks for this awesome post Rachel. When I come to your blog I always learn something new and this time is not an exception. Thanks for sharing. And by the way congrats for "2k to 10k writing" success. This is an awesome post! I work with a lot of aspiring writers, and character-driven plots are one of the hardest things to get across when critiquing. Like you said, because the plot and the *character-driven* plot are so similar (glass of water example was perfect), the nuance is often difficult to nail down. I know when I started writing, I always had this grand plot in my head, but the story would never tick because the characters didn't have the right motivation - they didn't make the critical choices, and so the plot kept happening *to* them. I'll definitely be sharing this with my fellow writer-buddies. Thank you for the great insight! Thanks for explaining character driven plot; I've never understood it before. I realize I go from right to left. Usually, I imagine a plot, setting, and conflict as one idea. My first novel "Zombie Turkeys" came while eating turkey and wondering what would happen if turkeys came back to like. This led to me writing it during Novel for November month. But I realize my characters must be realistic. I imagine how they would react to the situations I put them in and show how they change and grow through that. There are a series of conflicts as they are driven along by the plot. Bad things happen. Some people die. I wonder if by adopting a genre of parody, I've taken control away from the characters? In any event, I can't imagine making characters first, without a plot. What would be the point? So, your character driven plot is something I will just have to admire from afar. I so want to see an example of your plot timeline. 6. Sam meets Mrs. Helen Yoder at her farm. Workers Fred Jones and Harry Bishop dead. Minerva, I'll be happy to send you my Excel sheet for Zombie Turkeys. @jjvors Hey! I saw your Zombie Turkeys book mentioned on The Smarter Artist group. I read it and loved it. It was a really fun, funny book! Travis Bach: Thanks so much for your wonderful review! You really got the point of my humor! Maybe you'll like my next book, 'My Undead Mother-in-law'. I saw it today! Boom- sample downloaded.